A toothbrush can’t reach all the tight spaces between your teeth or the areas under your gumline. That can allow plaque to build up, threatening your oral health. 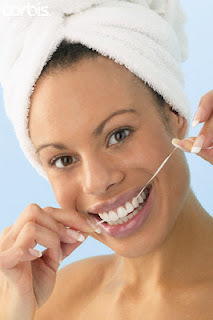 Flossing, though, removes those particles and improves oral health. -When you floss, gently ease the floss between your teeth. -Pull the ends of the floss against the front and back surface of a tooth so that the floss forms a “C” as it wraps around the tooth. -Gently pull the floss from the gumline to the top of the tooth to scrape off plaque. -Floss the backs of your teeth. -Use fresh floss as you progress through your teeth. -If you have trouble getting floss through your teeth, try waxed floss. -If it’s hard to manipulate the floss, try using a floss holder.